Finns Partykeep surging in the poles, maintaining 3rd position and up to 15% – The Tundra Tabloids……. The nationalist Finns Party posted the biggest gains, while the SDP, NCP and the Greens wobbled slightly. Changes were well within the poll’s margin of error. Voters are rallying behind the immigration-skeptic Finns Party according to Yle’s latest political barometer, which shows the group with 15.1 percent approval. The party posted a 1.8-percentage-point gain in the poll to outstrip Prime Minister Juha Sipilä’s Centre Party and grab third place as the country’s most popular political force. According to research director Tuomas Turja of pollster Taloustutkimus, the growth in backing for the Finns Party was especially due to so-called “sleeping voters” gravitating toward the nationalistic group. “The Finns Party are now getting more supporters from those who didn’t know or didn’t want to say which party they voted for in the 2015 election,” Turja added. 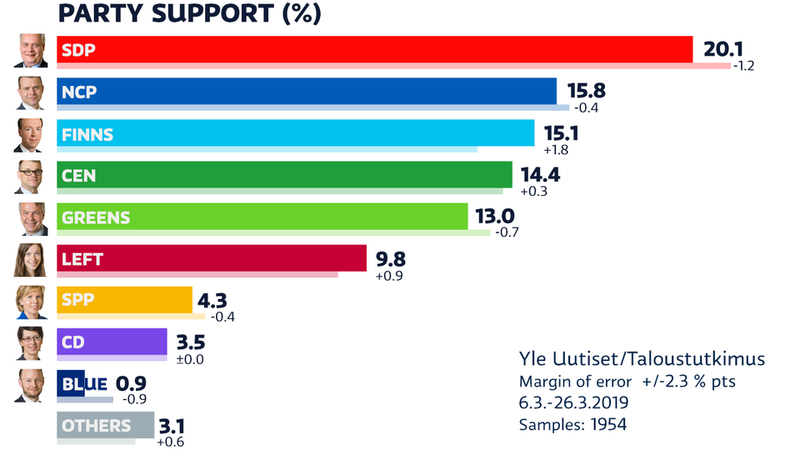 In spite of the Finns Party’s pre-election surge, the largest opposition group, the Social Democratic Party, remains at the top of the voter approval poll with 20.1 percent support, despite losing 1.2 percentage points of voter backing. Researcher Johanna Vuorelma of Tampere University noted that the margins separating parties in the Yle polls have narrowed. “The fact that we see four parties separated by less than three percentage points is a very different situation than two years ago, for example,” she pointed out, referring to municipal elections that took place in 2017. “We can see a very European development there. The landscape is fragmenting and no one party alone has the top position,” she added. She remarked that voter activity is likely to influence a party’s popularity. For example, Finns Party backers may include people who are highly likely not to vote. “In many ways, support for the Finns Party is difficult to forecast. But it could be that the party could once more surprise us during the election,” Vuorelma said, adding that minimal polling differences among parties also makes government negotiations trickier. Previous Post Previous Post Finnish converts to Islam playing key roles in sharia-supremacist communities……. Next Post Next Post David Reaboi: Railing against Islamophobia, and anti-Trump, too…….